Peace with the palestinians is an illusion. The goal is noble, but it’s not based in any kind of reality that exists in the real world. While Israel buries its dead – soldiers and citizens murdered while going about their normal lives, the palestinians will celebrate these “operations” by handing out lollies and naming town squares after the terrorists. The real peace process is not between Israel and the palestinians or even Israel and the rest of the Arab world. It’s between an Islamic society that is rooted in a centuries old intolerant dogma that says they need to rule the world. 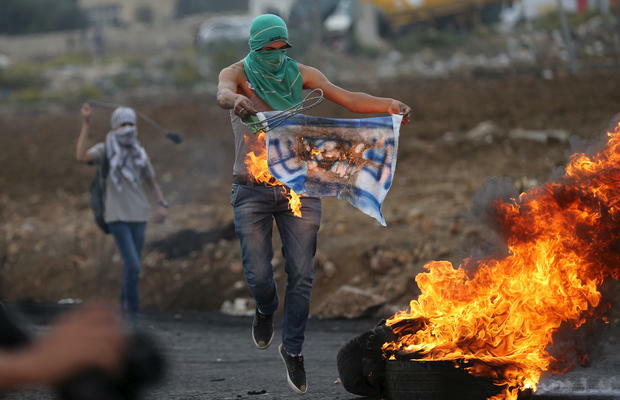 The palestinians want to blame everyone else in the world for their woes. They want all the pleasures of receiving copious amounts of money, yet none of the responsibility and accountability that goes along with it. And the world – instead of speaking out against this – actually facilitates it. The question that should be asked by any decent society is not what can Israel do to make peace, but what kind of society is it that celebrates their children murdering innocent people for the glory of a country that never existed. No country has ever done more to achieve peace than the State of Israel. It has given up huge amounts of land, evicted thousands of its own citizens, actually put its own security at risk – and for what? Not for some lasting peace, but for the hope that one day there might maybe be calm. And no group has ever done less to achieve peace than the Arab world and the palestinian authority who have rejected every possible peace overture, avoided any compromise at all, poisoned their children with hatred and encouraged murder with money and glory. If peace is ever to come to the Middle East, it will have nothing to do with Israel and everything to do with Arab society itself.